There are certainly those who prefer the sensory overload of theme parks, Las Vegas, Branson and their ilk, but many reunion members fancy the serenity and natural beauty of a more pastoral setting to reconnect and renew some of life’s most important relationships. One compromise would be to meet in the mountains one year and Orlando the next. But wouldn’t it be great to have a reunion that offers both the quietude of nature as well as a wealth of activity for those who crave action? Is there a place with scenic vistas, power shopping, lake resorts and mountain retreats, fishing and hunting, museums galore, history and heritage, arts and entertainment and a brand new Presidential Library? Yes, there is, and naturally, it’s Arkansas. Known for scenic natural beauty and genuine hospitality, Arkansas –“The Natural State” — boasts over 9,000 miles of rivers and streams, over 600,000 acres of lakes, and over 17 million acres of forestlands all under bluest, pollution-free sky. The Ozark and the Ouachita mountain ranges drift over the state’s northern and western regions while lush farmland spreads to the east and south. Groups can gather in any season: spring and fall bring mild temps and vivid color; summer days are warm and lingering; and even winter days are pleasant enough for a round of golf or tennis, hiking, fishing, and touring. The reunion planner’s only dilemma is deciding where in the state to meet. Large gatherings may prefer Little Rock, Hot Springs, Pine Bluff, Jonesboro, Fayetteville or Fort Smith, and smaller groups can choose just about any corner of Arkansas. Little Rock and North Little Rock put you smack dab in the center of the Natural State, while Hot Springs (one of America’s oldest resort cities) is jammed with history, attractions and sparkling lakes. If it’s the scenic Ozark Mountains you covet, Eureka Springs will delight, while Fort Smith offers an appealing riverside location. According to Kevin Sexton, Group Travel Consultant for the Arkansas Department of Parks and Tourism, Arkansas hosts at least 200 reunions yearly. “We provide assistance by giving reunions adequate brochures necessary to make their reunion in Arkansas successful,” Sexton explained. “It can be a Group Tour and Meeting Planner, Arkansas Tour Guide, Arkansas State Park Guide, Arkansas Adventure Guide, Arkansas Calendar of Events, or even an Arkansas Map. 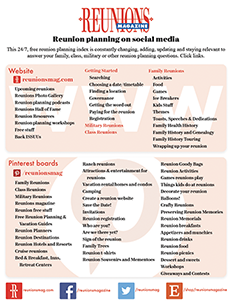 We are there to provide all the tools necessary to plan every detail of a reunion. We also provide some give-aways such as pens, stickers, lapel pins and other items. 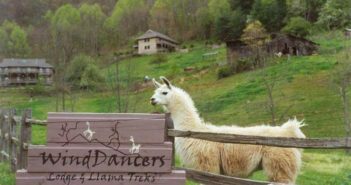 We here at Parks and Tourism act as a liaison between choices of destinations and reunion planners.” When you go to www.arkansas.com, click on “Group Travel” and explore the area for reunion planners. There’s an easy to use Reunion Facility Search Form to help find the type of facility that best suits your group’s needs. The site does the work for you, pinpointing the properties that match your group. Perhaps Hot Springs is your perfect match. “Hot Springs is the ideal place for groups of any size to hold a great reunion,” said Steve Arrison, Executive Director of the Hot Springs Convention & Visitors Bureau (CVB). “Nestled in the picturesque Ouachita Mountains, Hot Springs offers the perfect combination of natural beauty, exciting activities and attractions, and a cosmopolitan atmosphere that is sure to satisfy large reunion groups or small family get-togethers.” Arrison went on to say, “With the nation’s only national park located entirely in a city, Hot Springs has a colorful history, 4,000 hotel and motel rooms, 200 restaurants and more than 50 family attractions. Whether you are interested in fishing, boating, the Historic Downtown District, a major theme park, thoroughbred horse racing at Oaklawn Park, fine art galleries, golf, thermal water spas or just plain relaxing â€” Hot Springs National Park is the place for your reunion.” For more information on planning and scheduling your reunion, call 888-SPA-CITY or visit www.hotsprings.org. Katina Brown, Family Reunion Coordinator for the Little Rock CVB, assists planners from selecting the right lodging to rolling out the red carpet. “Our goal is to help build memories that will last a lifetime,” Brown said. “We provide personal touches that make Little Rock the perfect location for your reunion. When you choose Little Rock as your reunion center, you don’t have to spend hours calling hotels and motels. We forward your lodging request to all local facilities that meet your specifications. Then, you’ll receive bids qualified to ensure your lodging accommodations fit your group to a ‘T’.Â Planning group activities for different ages or for groups with children can be difficult,” Brown noted, “but with years of hands-on experience, we can help develop the perfect reunion itinerary that includes suggestions for group gatherings, optional activities and free time.” Your Little Rock reunion can include time for touring the new William Jefferson Clinton Presidential Center and Park, art galleries, historic sites, museums, golfing, shopping, family play, rest time or a spa experience. 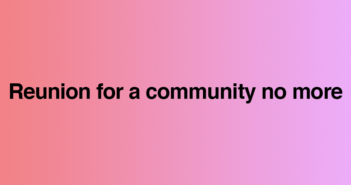 “We will work hand-in-hand with you and your planning committee to design an itinerary that brings your committee praises for a successful reunion and a job well done. Last but not least, don’t forget we’re famous for our “Southern Hospitality” that both locals and visitors appreciate!” Brown beamed. The CVB’s services include reunion group mailing and souvenir items and services. For mailings, CVB will duplicate your original, stuff and label the envelopes and pay postage for one mail out to your reunion attendees. Do some of the guests need rental cars? Would they like a discount? Wouldn’t it be cool to see your reunion name on the marquee? The CVB can provide with vendor choices and costs for special reunion t-shirts and souvenir items, badges, shirts and caps. “Let us arrange for a welcome bag of Little Rock promotional items for all of your attendees or a one-of-a-kind gift bag you can offer as a presentation to a special member of your gathering — the oldest family member or a founding father,” Brown added. The coordinator of the Banks & Horton Family Reunion, Patricia Griffen, echoes the sentiments about Little Rock. “With the River Market, Clinton Library and activities on the Arkansas Riverfront, Little Rock is an ideal location,” she said. “It is not congested, easy to navigate, affordable and accessible by most major airlines.” Griffen also agrees that support and assistance from the Little Rock CVB is most helpful for coordinating a successful meeting. Between 50 and 75 family members were expected in Little Rock in June for the Friday night banquet, introduction of families present, induction of senior citizens into the Banks-Horton Hall of Fame, music, dancing and poetry readings — and that’s just the first night! The next day the clan takes an African American Tour and visits historic sights and churches before the Family Picnic at Alsopp Park. Sunday brings family worship at the hotel, scholarship awards and family history, essay readings, a Memorial Service and a business meeting. Of course, some people choose Little Rock because there’s no place like home. Vickie Carroll, planner for her Lee & Layton Reunion in 2004, reported that 99% percent of the family resides in North Little Rock, and the family cemetery is in Sweet Home, Arkansas, about 20 minutes outside of Little Rock. The family cemetery visit and memorial service is a very important part of the family’s gathering every other year. Even though Arkansas is home, Carroll thinks the state has something for everyone. “I would recommend Arkansas as a place for families (especially African American families) to host their reunions because of its history, with strong ties to the black community with places such as Central High School, the Daisy Bates Museum and the Clinton Library. I mention the Clinton Library because of the good things President Clinton did for African Americans while he was in office. As a result of his contributions to the African American community, he was the first non-African American to be inducted into the Black Hall of Fame in Little Rock,” Carroll concluded. It seems “The Natural State” indeed has something for everyone whether it’s the mountains, some of the cleanest waters in the country, shopping for antiques, browsing museums or bathing in the thermal healing waters of Hot Springs. “I’ve spent my whole life living, working, and playing in Arkansas,” explained Kevin Sexton. “The time I’ve spent at different places in Arkansas, whether outdoors (canoeing, fishing, hiking or golfing) or inside, we’ve always found something to do right here. I personally grew up visiting our State Parks, digging for diamonds, hiking to waterfalls and spending time at the lake. I’m proud to say that I consider myself lucky to live in such a great state that has so much to offer not only to tourists, but to its residents as well.” Get going and start planning your Arkansas reunion at www.arkansas.com/group-travel/reunion-planners/ or ring up 800-NATURAL. Contact Little Rock CVB at 800-844- 4781 or www.littlerock.com. Get details about Hot Springs at 800-SPA-CITY or by visiting www.hotsprings.org/.